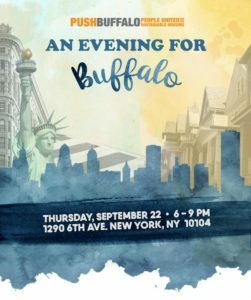 PUSH Buffalo invites you to a terrace party to celebrate how far Buffalo has come, and to envision an even brighter future. As a city that was torn apart by decades of disinvestment, we are reclaiming the crown of the Queen City and the future wellbeing of our communities. Buffalonians from the North, South, East and West Sides are coming together to reimagine and remake our city into one that we’re proud of; into one that holds true to the “City of Good Neighbors,” with access to family-sustaining jobs, decent homes to live in, and healthy and strong neighborhoods. As PUSH Buffalo members and community residents realize their dreams can be reality, they have put Buffalo on the forefront of a movement powered by community-driven revitalization. Please join us in NYC this fall in acknowledging the incredible accomplishments that PUSH Buffalo and our city have made, and recognizing the movement builders and workers that have made it all possible. Attendance is free, but a request for your voluntary financial support will be made. To RSVP to An Evening for Buffalo, email Aaron Bartley ataaronbartley@pushbuffalo.org.